Foothills. Woodlands, openings. Spring, early summer. Near Dolores, Colorado in San Juan National Forest, June, 13, 2006. The only Colorado population of this lovely Onion was found in 1998 by San Juan National Forest employee Charlotte Thompson while she was doing wildlife surveys. She recognized the plant as unusual and brought it to co-worker Mary Kemp who remembered seeing it when she lived in Oregon. It was finally a third San Juan National Forest employee, Leslie Stewart, who keyed it out and realized that it was a plant found nowhere else in Colorado and that it was, in fact, hundreds of miles from its nearest relatives in northern Utah. 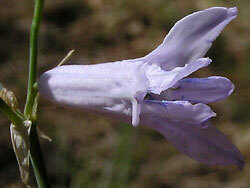 Click to read the United States Forest Service Triteleia grandiflora species assessment. Triteleia grandiflora is found in most counties of Oregon, most central and eastern counties of Washington, western and eastern counties of Idaho, far western counties of Montana, and northeastern counties of Utah. It is rare in just a few counties of California and Wyoming. Thus the far southwestern Colorado population is quite isolated -- a "disjunct population". Such a disjunct population may be caused by glacial activity that isolates the population, by the spreading of plants by animals, by fire, climate change, etc. How the Colorado population of T. grandiflora got separated so dramatically from the northwestern populations, no one knows, but one guess is that Native Americans (probably Utes) carried it here to plant and eat. Triteleia grandiflora grows from eight to twenty-eight inches tall with flowers about an inch long in clusters of up to a dozen. 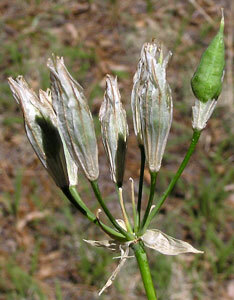 The one or two, long, thin leaves (shown to the right of the ruler) can be taller than the flower stalk. Because the bulb is up to 8 inches below the ground, the plant manages to grow nicely even in extreme drought conditions (such as occurred in the winter and spring of 2005-2006). 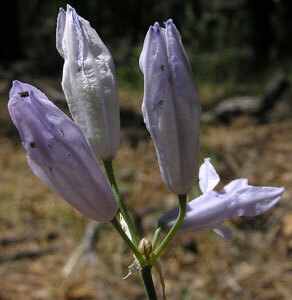 The Triteleia genus was named by David Douglas (of Douglas Fir fame) after he found this species in "North-west America". Douglas first published the genus name in 1830 with John Lindley, who described this species. Triteleia is from the Greek "trios" and "teleios", "three" and "complete", referring, in the words of Intermountain Flora, "to the minutely lobed stigma which seems entire ["complete"] on dried specimens".